Chicago native and Morehouse-bound Kayin Barclay is currently competing in the 13th North American Chess Association FIDE Invitational. This is his first closed norm tournament and he is looking to make a good showing. 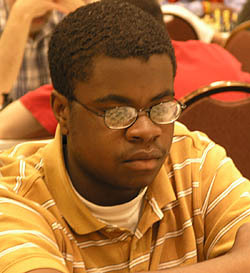 Barclay, a two-time Denker representative, is also attempting to get the requisite score to reach the 2200 USCF rating. The tournament is hosted by IM Angelo Young at the Touch Chess Center on North Ashland in Chicago. The tournament will run through July 25th. The tournaments are held throughout the year and has given several rising juniors a chance to compete against strong competition. The 13 tournaments have offered opportunities for IM norms… three are needed (and a 2400 FIDE rating) to earn the actual title. Thus far, five rounds have been played, but the NACA website only has results up to round four. Kayin Barclay plays Jake Kleiman in round 6. Crosstable and pairings here. Tate and I both have 2 points out of 5. I drew IM’s Tate and Kuderinov. I lost to FM Stamnov and IM-elect Pasalic even though I was winning both. I beat Michael Thaler from NY last night even though I was blessed when he messed up an attack. A draw with FM Florin Felecan keeps Barclay at an even score (3.5/7). He should be over 2200 now. I read an interesting article on your father and I wish you a happy belated birthday ( Jun 19 ) . Great to see you doing well but Tom Fineberg is not. Barclay beats Akopian. No not THAT Akopian! He beat Robert Akopian and now sits on +1. He will close out the tournament by playing IM Mesgen Amanov. If he’s able to hold this game, he’d end on a solid score and a near-2500 performance rating. Well, well Marvin! I have heard about Fineberg, but not the latest. Well… Fineberg may be glad to know that Kayin Barclay is going to be a Master in a matter of days. Yes… the book is going fairly well, but there have been challenges. I saw the other Marvin (Dandridge) during the Chicago Open and he met my father. Go K. Barclay, I saw this young brother in Georgia for the High school championships. Didn’t get a chance to talk to him, but he seemed like a humble young man. I am pulling for you lil bro. Raise the bar for those coming behind you. Make your mark and it will outlive you. Strive to paint masterpieces of art with your play. Know that I for one am pulling for you to get your IM and GM titles. Coach Rene’ and The Chess Gym! Barclay closed out the tournament by falling against Amanov, but what a strong performance! I have checked the USCF rating estimator and his performance puts him a tad over 2200. Below are his opponents’ USCF rating in case someone wants to calculate. This is still a solid result for that tournament. I could only wish to have such results. I remember the environment when I was in Chicago a couple of months ago. Playing in such intimate conditions can be intimidating for some people. I am sure the pressure is intense to perform solidly. I am very proud of Kayin and look forward to seeing him in Atlanta. Good stick-to-it-ness Kayin…you started slow but finished solid = great!! Wow. From Emory Castle to this…I was honored to see him progress. Do it, young Morehouse! Congrats Kayin, there is no limit to your potential to expand. I wish you balanced peace (Maat-Hetep) in all your future endeavors. glad to see someone from little bitty Morehouse do something with themselves…hehehe! Below are the final standings of the 13th North American FIDE Invitational. FM Aleksander Stamnov lost to tailender Robert Akopian and came up short in his quest for an IM norm. That is a classic scenario that will haunt Stamnov for a long time. Michael Thaler started strong, but lost his last two games to finish even along with Barclay. IM Emory Tate has a disappointing show and ended on a loss to FM Jake Kleiman. It would be interesting to get a look at the games from the tourament. According to Barclay, the organizers kept the scoresheets. school and chess appropriately. I am always available for discussion. Check out new essay on Kayin Barclay! Who will be going to Miami for the tournament, Sept 10 – 14? Looking for a roommate. I have tentative plans for Miami. This may actual be the last tourney I can play in this year, since I have several trips abroad planned. One way or another I will see you soon. The tournament is now rated. Congratulations Kayin on earning the title of National Master! Congratulations on successfuly fulfilling the master title of the most wonderful game of all time!